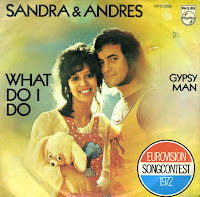 Sandra and Andres represented the Netherlands in the 1972 Eurovision Song Contest with 'Als het om de liefde gaat'. 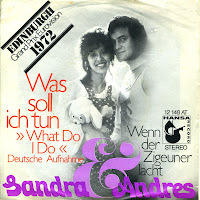 They also recorded two versions in other languages: the song was titled 'Was soll ich tun' in German and 'What do I do' in English. It's a miracle that my friend Puck and I didn't buy the same singles on May 5. While he bought 'Als het om de liefde gaat' and this English single somewhere else in the country, I was back in my hometown buying the single 'Was soll ich tun'. Like I mentioned here, it's a miracle that Puck and I didn't buy the same singles on May 5. While he bought 'Als het om de liefde gaat' and its English version (soon on this blog) somewhere else in the country, I was back in my hometown buying this single: 'Was soll ich tun', the German version of 'Als het om de liefde gaat'. Part of the charm of Eurovision collections is owning different language versions of entries. They are often collectable, because Eurovision artists usually don't have a lot of success abroad. As was the case with this one: it did not chart anywhere.